For some sports fans the month of March can’t come fast enough. March means March Madness and the College Basketball Tournament of course. I haven’t followed much of the action this year because I didn’t fill out any fantasy brackets, but it was nice to see the UWGB woman’s team make the tourney and it was fun to watch Terry Evens from the UWGB men’s team in the dunk contest. But for those who don’t follow College B-Ball at all, it’s okay cause this blog isn’t about sports anyways. My roommate on the other hand is obsessed with College Basketball and filling out those brackets. I call him the Bracket Master. In the spirit of the month, he came up with an idea to incorporate his love of College Basketball with his other love…movies. He told the 3 of us that we should all pool our DVDs together to make a 64 movie super bracket to see what our favorite movie is between the four of us. At first we thought he was a little loopy and probably bored off his mind, but after he constructed the bracket itself…we all got into the same spirit. From here, each of us put in our 16 favorite DVDs and then randomly placed them with different rankings and match-ups. The bracket was made up of 4 sheets of paper and was tacked to the wall. But I thought it would be nice for you guys to see what the outcome was, so I copied it onto my computer. The format of the bracket is the same as any bracket but without the lines. I hope you all can follow it easily. So how did we determine the winner of each match-up with 4 people? Well, we didn’t simply have the higher seed win…Ex) The 1 seed did not automatically beat the 16 seed; it was up to a vote. It’s hard to vote on something with 4 people because there is always a chance it will be a tie, but we used a gold coin when this occurred…leaving the entire decision up to chance. As you can see, the movie Departed ended up winning the entire bracket, making it our favorite movie between the four of us and the winner of UWGB Madness. It’s funny because that movie is not any of our single favorite movies, but when we all voted together…that’s how it worked out. I would have loved to see it lose to Back to the Future, but my roommates had the vote and majority ruled. I hope you enjoyed my story of something fun my roommates and I did in the spirit of March Madness. The fact is, there are many more stories where that came from. When you’re in college and get to live on campus, there are many opportunities to have very spontaneous, random moments and that usually proves for an entertaining night. 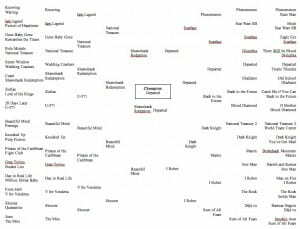 To conclude, I would like to hear your comments on this bracket. Do most of our votes compare to those that you would have made? 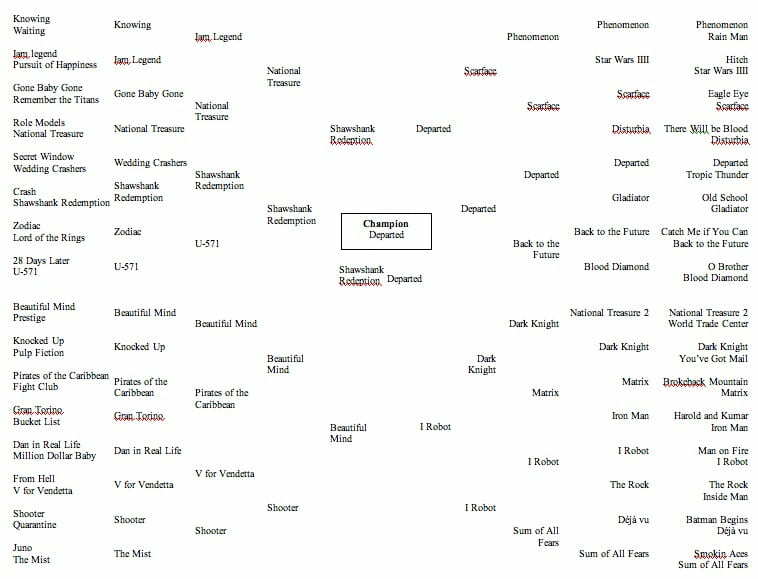 Or what movie would you of had winning the whole sha-bang? Thanks! This entry was posted in Random Thoughts, The First Year, The Process by MICHAEL SCHILLEMAN. Bookmark the permalink.